Digital health revolves around the integration of traditional healthcare systems and newer technologies to improve efficiency, value for money and ultimately patient outcomes. Electronic Health Records (EHR) have been a big part of this evolution, promising universal access to key elements of a patient's medical history. As many nations have now adopted EHRs, the debate has moved on to what can be done with this data. Interoperability and analytics have become important requirements of healthcare IT systems. Improving access to healthcare and the convenience of that access has become a key goal. As these new IT systems develop, disruptive technologies are now being utilized as part of the digital health landscape. Leading the charge for this disruption is Artificial Intelligence (AI) and chatbots. According to the latest worldwide market study by Juniper Research, the annual cost savings derived from the adoption of chatbots in healthcare will reach $3.6 billion globally by 2022 -- that's up from an estimated $2.8 million in 2017. This market growth will average 320 percent per year, as AI powered chatbots will drive improved customer experiences for healthcare patients across the globe. 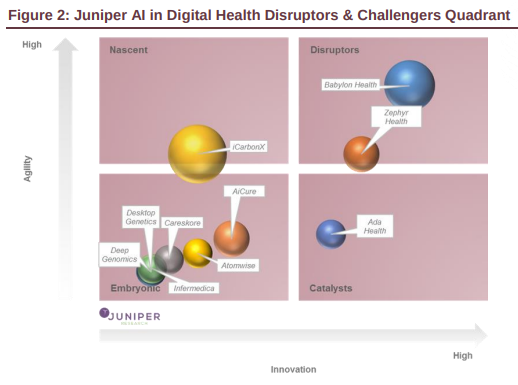 According to the Juniper assessment, using sophisticated chatbot systems, patients will be able to access services more quickly and easily, improving access to care and reducing pressure on overworked healthcare systems by ensuring more efficient interactions. The new research found that despite trials by, for example, the UK's National Health Service, chatbot deployment will likely be dominated by Far East and China over the next five years. Over half of the annual savings realized by chatbots will be attributable to this Asia-Pacific region in 2022. Owing to the varied quality of care in countries such as China, chatbots will be useful for directing patients to appropriate services, which in turn will drive adoption. The research predicted that chatbots -- when used to triage patients -- would have a dramatic impact on healthcare efficiency. 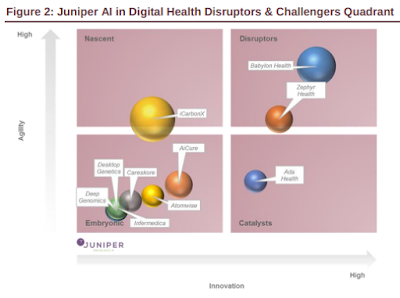 Juniper urged service providers to focus on overcoming the current poor level of interoperability of many healthcare IT systems in order to enable chatbots to unlock the full benefits. Additionally, it cited data security as critical towards maintaining patient trust. Additionally, the research found that chatbots face substantial challenges in developed healthcare systems, such as those in the U.S. and UK markets. Systems at a mature stage of development are generally more conservative in introducing new technology than others, often resulting in inefficient care. Juniper believes that this conservatism will most likely slow chatbot adoption relative to emerging markets, such as China and India, where small-scale technology deployments are already occurring.